The World Health Organization (WHO) estimates that there are about 2 billion people worldwide who consume alcoholic beverages and 76.3 million with diagnosable alcohol use disorders. The 2010 analysis of 67 risk factors and risk factor clusters for death and disability found that alcohol consumption was the third leading risk factor for death and disability accounting for 5.5% of disability-adjusted life years (DALYs) lost globally. In India, alcohol consumption is one among the top ten risk factors and attributable to nearly 3% of DALYs lost. The National Survey of Drug Use in India, recorded alcohol use in the past year in only 21% of adult males. Relapse is a complex and dynamic phenomenon that appears to be determined by biological, psychological, and social factors and an interaction among these. In one of the most influential social-cognitive behavioral models proposed by Marlatt, relapse has been viewed as an unfolding process, in which resumption of substance use is the last event in a long sequence of maladaptive responses to internal or external stressors. This perception of self-control continues till the person encounters a “high-risk” situation. Three categories of such situations, namely, negative emotional states, interpersonal conflicts, and social pressures, have been proposed. Nonrelapsers responded to problems in a more assertive, noncompliant, drink-refusing manner, as compared to relapsers. On life events measures, though both groups experienced the same total number of life events, nonrelapsers perceived their events as significantly more positive than relapsers. Despite differences in emphasis, contemporary relapse models include several domains of antecedents. Among these are stressful life events and negative mood states, drug expectancies, self-efficacy, coping behaviors, and social support resources. Subjective craving is commonly included in models of relapse as an appetitive aspect of physiological and psychological withdrawal. Motivational states including decisional balance and stages of receptivity to change have also been investigated. A further complexity in studying antecedents of relapse is a lack of consensus regarding the definition of a relapse. Different individual characteristics are predictive of different types of treatment outcomes such as complete abstention, asymptomatic drinking, reduced but still problematic drinking, and unremitted impairment as drinking that leads to loss of control. Therefore, relapse as a central issue in the treatment of alcohol dependence warrants further study. The present study attempts to address this complex and intriguing issue and is an effort to study the factors that predict the vulnerability to relapse in cases of alcohol dependence syndrome. To identify and study relative contribution of relapse precipitants, life events, and dysfunction in patients undergoing treatment for relapse of alcohol use. The study was conducted at a tertiary care hospital. The sample consisted of 100 male patients of alcohol dependence syndrome diagnosed as per the International Classification of Diagnostic criteria (ICD-10) (WHO, 1992) undergoing treatment for relapse at a psychiatric center. An equal number of socio demographically matched patients without relapse were taken as controls. Patients free from any physical or psychiatric disorder affecting ability to recall/report the required information. A total of 200 patients were enrolled. Relapse was defined as re-emergence of ICD-10 diagnosis of alcohol dependence syndrome and remission was defined as complete abstinence from alcohol at least for a month. All patients underwent thorough physical examination and screening tools such as Cut down, Annoyed, Guilty, Eye opener (CAGE) and Alcohol Use Disease Identification Test (AUDIT) were administered on admission to identify relapsers and nonrelapsers. The data were statistically analyzed using the Statistical Package of Social Sciences (version 12.0), North Illinois university, USA. Independence of the attributes was compared using Chi-square contingency table analysis. Comparisons of the means in the groups were done using the Student's t-test. A significance level of P < 0.05 was accepted for all analyses. Armed Forces Medical College Life Events Scale: It is a 52-item scale for measuring life events in service personnel who hail from various parts of the country and have a subculture of their own. It includes the unique stresses of service personnel that are not included in any life events scale available in India or in the West. The scale has concurrent validity when compared with the Presumptive Stressful Life Events Scale. The mean age of patients with alcohol dependence syndrome was 38.03 years (±7.365) and 43.5% patients in the whole sample were in the age group of 31–40 years. Majority (94%) of the patients in both the groups were married. Higher proportions of patients in nonrelapsed group (81%) were educated above matriculation level as compared to those in relapsed group (72%). Mean age of onset of drinking in the whole sample was found to be 26.12 years (+5.046). More number of relapsers (62%) had a history of <10 years of alcohol drinking duration as compared to nonrelapsers (53%). As regards alcohol-related difficulties, 50% of nonrelapsers had alcohol-related accidents and 28% had marital strife as compared to 6% and 13% in relapsers. However, the relapsers group was found to have more number of punishments (13%) as compared to the non relapsers group (6%). Overall, the difference between both groups was found to be statistically significant (P = 0.001). Craving was maximally reported by both groups as the reason for relapse (53%), followed by “tension and stress” (8.5%) and social pressure (7.5%) as the reasons for reinstatement. The difference between the two groups for reasons stated for relapse was statistically significant with P = 0.005. 74% of relapsers had some significant past history [jaundice (13%), head injury (10%), seizures (0%), combination of either (19%) & family history of alcohol consumption (32%)], as compared to (51%) of non relapsers [jaundice (9%), head injury (12%), seizures(3%), combination of either (9%) and significant family history (18%)]. The difference was found to be statistically significant with P = 0.002. Higher proportion of relapsers (92%) showed signs of withdrawal/hepatomegaly as compared to nonrelapsers (6%), with difference being statistically significant (P = 0.001). Relapsers (92%) had deranged biochemical parameters as compared to the nonrelapsers (10%), with difference being statistically significant (P = 0.001). Analysis of CAGE questionnaire, where a score of ≥2 was taken as the cutoff, showed 91% of relapsers with significant score as compared to 44% of nonrelapsers and the difference was statistically significant (P = 0.001). Similarly, on administering AUDIT screening, 83% of relapsers reported significant score as compared to only 1% of nonrelapsers. Similarly, on analysis of AUDIT core, higher proportion of relapsers (96%) had significant score as compared to nonrelapsers (64%) and the difference was statistically significant (P = 0.001). Mean number of desirable events in the past 1 year for the whole sample was 3.46 (+1.69) with nonrelapsers reporting higher mean number of desirable life events in the past 1 year with 3.74 (+1.72) as compared to relapsers with 3.19 (+1.63), with statistically significant difference (P = 0.038). Mean for the total number of undesirable life events for the past 1 year in the whole group was 1.52 (+1.54), with relapsers reporting more number of undesirable life events (1.92 [+1.662]) as compared to nonrelapsers (1.12 [+1.31]) and the difference was statistically highly significant with P = 0.001. Although the total mean number of life events in the past 1 year was comparable between the two groups, mean of total stress score in the relapsed group was found to be higher (82.29 [+23.65]) as compared to nonrelapsed group (70.47 [+27.77]), with a statistically significant difference of P = 0.008. 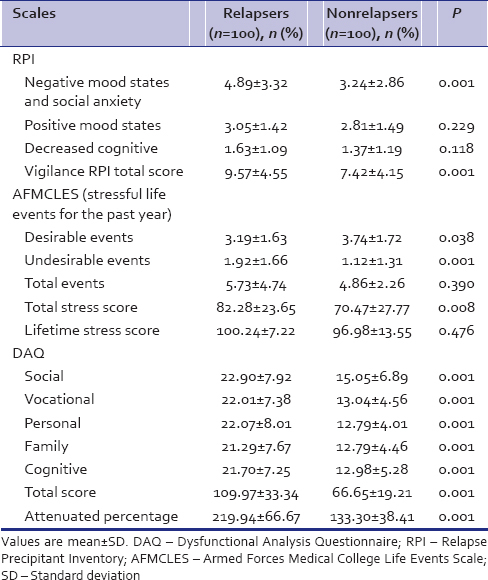 On analysis of RPI, the mean number of precipitants in Factor I (negative mood states and social anxiety) was 4.89 (+3.32) in relapsers versus 3.24 (+2.86) in nonrelapsed group. This difference was statistically significant (P = 0.001). Dysfunction Analysis Questionnaire was used for the assessment of dysfunction in various spheres such as social, vocational, personal, family, and cognitive. Mean dysfunction reported by relapsed group was higher than that in nonrelapsed group in all the spheres of functioning and the difference was statistically highly significant (P = 0.001). Attenuated score percentage that was calculated showed that relapsers had a mean of 219.94 (+66.67) as compared to non relapsers (133.30 [+38.41]) and it was statistically highly significant (P = 0.001). In the present study, the mean age of alcohol dependence syndrome was 38.03 years (±7.365), which is similar to results found in other studies., The most vulnerable age group in the study was <30 years, comprising 22% of the relapsed group as compared to 16% in the nonrelapsers [Table 1]. The finding of the present study with regard to initiation of alcohol at younger age is in close consistence to a WHO study group on “young and drugs” which stated that most of the experimentation and initiation of dependence-producing drugs take place during adolescence. Therefore, it is mandatory to keep this high-risk age group under strict surveillance with more frequent follow-ups. The contribution of the patients' marital status toward relapse was not found to be statistically significant. Mean age of the onset of problem drinking in our study was found to be 26.12 (+5.046) years. At the time of our assessment, 40% of respondents had been drinking for a period of 6–10 years. The physical and psychosocial consequences of problematic drinking habits generally take this duration so as to manifest, warranting de-addiction. The relapsed and the nonrelapsed groups were comparable with regard to the quantity and frequency of alcohol drinking, leading us to conjecture that, after their initial detoxification and adequate de-addictive therapy, during the 12-month follow-up, their relapse potential remains the same. Psychosocial implications of alcohol consumption included alcohol-related difficulties reported by 73.5% patients in the whole sample [Table 2]. Interestingly, the 97% patients in nonrelapsed group reported alcohol-related difficulties as compared to 50% in relapsed group. Alcohol-related accidents were reported by 50% in nonrelapsed group as compared to only 6% patients who had relapsed. An impression that can be derived is that alcohol-related accidents acted as a deterrent for further alcohol consumption and future relapses. 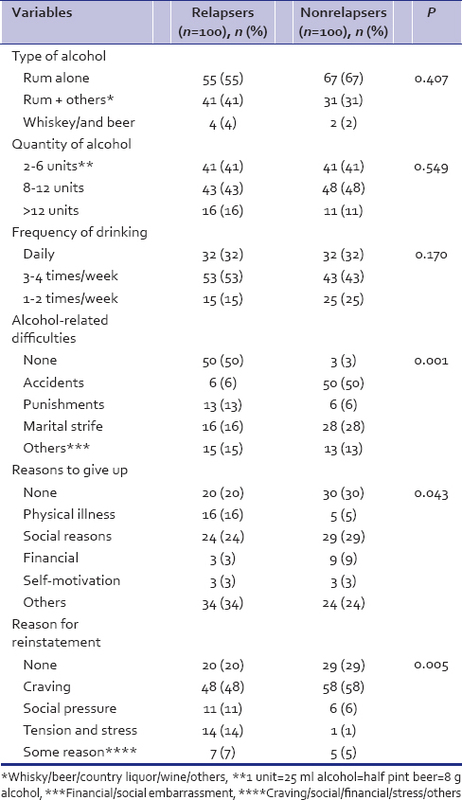 Nearly 13% of individuals who relapsed were found to have more alcohol-related punishments and another 15% reported other difficulties such as financial problems, social embarrassment, and altercations as compared to 6% of nonrelapsers who had alcohol-related punishments and 13% who had other difficulties and these findings were in consonance with findings reported by previous studies. Nearly 57% of the relapsers had made more than one attempt, as compared to 50% of the nonrelapsers. The most common reasons cited to give up alcohol included social reasons by 26.5% followed by physical illness in 10.5% with other reasons such as financial and legal crisis, which were also elucidated in other studies. 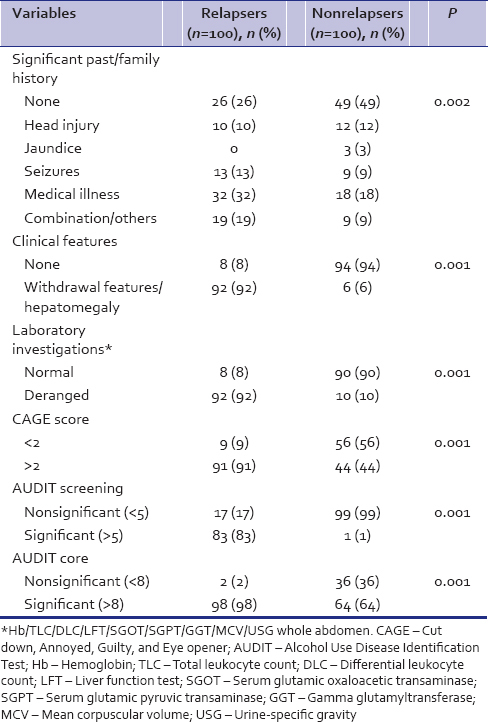 On clinical evaluation for abnormal physical findings, especially alcohol withdrawal features and alcohol-induced hepatomegaly, quite expectedly, 92% of the relapsers revealed significant physical abnormalities, as compared to only 6% of the nonrelapsers [Table 3]. Thus, the conjecture that can be drawn is that patients who had features of withdrawal had more propensities for relapse. Similar findings were reported by old studies who listed 37 physical “warning signs” for impending relapse. It was observed that hyperexcitability in the postacute withdrawal state, maintained by hyperventilation, may contribute to relapse. Two screening instruments, i.e., CAGE and AUDIT were used in this study to detect problem drinking among the inpatients. Use of two instruments increases the sensitivity and specificity of the screening procedure and decreases the number of false-negative cases. In addition, they have a cross-cultural applicability which was well utilized in this study, since our patients belonged to varied geographic and cultural backgrounds. In CAGE questionnaire, a cutoff score of 2 was used, and there were significant differences between the relapsers and nonrelapsers. In AUDIT (core), a cutoff value of 8 was taken and 96% of relapsers reported significant value as compared to 64% of nonrelapsers. This prompts us to reiterate the well-established usefulness of these instruments in identifying individuals at harmful or hazardous levels of alcohol drinking. The stress scores for undesirable life events reported by relapsers was 42.00 (+21.26) higher as compared to 28.98 (+26.67) by nonrelapsed group (P = 0.002), which were similar in other studies., The relapsed group of patients reported less number of desirable life events in the past 1 year (3.19 [+1.63]), as compared to the nonrelapsers (3.74 [+1.72]). This finding was also elucidated in other study, where this outcome was explained by the fact that the data were collected after patients had relapsed and there was a possibility that the relapsers perceived their experiences as more negative as compared to nonrelapsers. Other studies proposed a hypothesis that both discrete, stressful life events and chronic stressors may play a role not only in the development of alcoholism but also in relapse. It was further supported by their findings that severe stress (defined as life adversity, posing either a high personal threat or chronic coping demands) which occurred prior and independent of alcohol use were related to relapse after treatment. At the end of this study, we have reached upon this conclusion that relapse in alcohol dependents is an interaction of many factors and multiple layers of assessment may be required to predict relapse. Since one cannot focus only on one level exclusive to others, use of multivariate, multidimensional assessment is essential. Single baseline level at the beginning or end of treatment experience is insufficient to predict subsequent relapse. Retrospective study design and tendency to attribute failure to external factors and success to internal factors are the limitations of the study, which may contribute to an artifactual weighing of relapse precipitants on interpersonal or nonpersonal factors. Focusing only on those events immediately prior to a relapse is likely to lead to a false assumption that only these are the variables leading to relapse due to temporal proximity, and other variables more distant in time have no influence on the occurrence of relapse. World Health Organization. Global Status Report on Alcohol and Health 2014. Geneva, Switzerland: World Health Organization; 2014. Ray R, Mondale AB, Gupta K, Chatterjee A, Bajaj P. The Extent, Pattern and Trends of Drug Abuse in India: National Survey. New Delhi, India: Government of India, United Nations Office on Drugs and Crimes and Ministry of Social Justice and Empowerment; 2004. Hendershot CS, Witkiewitz K, George WH, Marlatt GA. Relapse prevention for addictive behaviors. Subst Abuse Treat Prev Policy 2011;6:17. Salemink E, Wiers RW. Alcohol-related memory associations in positive and negative affect situations: Drinking motives, working memory capacity, and prospective drinking. Psychol Addict Behav 2014;28:105-13. Adinoff B, Carmody TJ, Walker R, Donovan DM, Brigham GS, Winhusen TM, et al. Decision-making processes as predictors of relapse and subsequent use in stimulant-dependent patients. Am J Drug Alcohol Abuse 2016;42:88-97. Williams EC, Frasco MA, Jacobson IG, Maynard C, Littman AJ, Seelig AD, et al. Risk factors for relapse to problem drinking among current and former US military personnel: A prospective study of the millennium cohort. Drug Alcohol Depend 2015;148:93-101. Buchsbaum DG, Buchanan RG, Centor RM, Schnoll SH, Lawton MJ. Screening for alcohol abuse using CAGE scores and likelihood ratios. Ann Intern Med 1991;115:774-7. Bush K, Kivlahan DR, McDonell MB, Fihn SD, Bradley KA. The AUDIT alcohol consumption questions (AUDIT-C): An effective brief screening test for problem drinking. Ambulatory care quality improvement project (ACQUIP). Alcohol use disorders identification test. Arch Intern Med 1998;158:1789-95. Matoo SK, Malhotra R. Relapse precipitant inventory: Hindi adaptation and factor structure. Indian J Clin Psychol 2000;27:278-85. Pershad D, Verma SK, Malhotra AK, Malhotra S. Measurement of Dysfunction and Dysfunction Analysis Questionnaire (DAQ). Agra: National Psychological Corp.; 1985. Chakraborty PK, Katoch V, Singh H. Comparison of relapse vs. abstinent group of alcohol dependence patients in serving personnel of the Indian army. Indian J Psychiatry 2001;43:15-6. Chandrasekaran R, Sivaprakash B, Chitraleka V. Five years of alcohol de-addiction services in a tertiary care general hospital. Indian J Psychiatry 2001;43:58-60. Grant BF, Stinson FS, Harford TC. Age at onset of alcohol use and DSM-IV alcohol abuse and dependence: A 12-year follow-up. J Subst Abuse 2001;13:493-504. Chih MY, Patton T, McTavish FM, Isham AJ, Judkins-Fisher CL, Atwood AK, et al. Predictive modeling of addiction lapses in a mobile health application. J Subst Abuse Treat 2014;46:29-35. Melemis SM. Relapse prevention and the five rules of recovery. Yale J Biol Med 2015;88:325-32. Just-Østergaard E, Mortensen EL, Flensborg-Madsen T. Major life events and risk of alcohol use disorders: A prospective cohort study. Addiction 2018;113:25-33. Kumar R, Maheshwari SK. Relapse precipitants, life events & coping behaviors among substance users. Indian J Psychiatric Nurs 2016;12:14-8. Snelleman M, Schoenmakers TM, Van de Mheen D. Relapse and craving in alcohol-dependent individuals: A comparison of self-reported determinants. Subst Use Misuse 2018;1:1-9. Mattoo SK, Basu D, Malhotra A, Malhotra R. Relapse precipitants, life events and dysfunction in alcohol and opioid dependent men. Indian J Psychiatry 2003;45:39-44. Chaudhury S, Das SK, Ukil B. Psychological assessment of alcoholism in males. Indian J Psychiatry 2006;48:114-7. Raju M, Chaudhury S, Sudarsanan S, Salujha SK, Srivastava K. Trends and issues in relation to alcohol dependence in the armed forces. Med J Armed Forces India 2002;58:143-8. Cooney NL, Litt MD, Morse PA, Bauer LO, Gaupp L. Alcohol cue reactivity, negative-mood reactivity, and relapse in treated alcoholic men. J Abnorm Psychol 1997;106:243-50.
Cooper ML, Frone MR, Russell M, Mudar P. Drinking to regulate positive and negative emotions: A motivational model of alcohol use. J Pers Soc Psychol 1995;69:990-1005. Marlatt GA, Donovan DM. Relapse Prevention: Maintenance Strategies in the Treatment of Addictive Behaviors. 2nd ed. New York: Guilford Press; 2005. Malhotra S, Malhotra S, Basu D. A comparison of the beliefs of Indian alcohol-dependent patients and their close family members on their reasons for relapse. Addiction 1999;94:709-13.